Respected entertainment lawyer, award-winning producer, songwriter and author, Trent University alumnus Stephen Stohn ’66 can now add another esteemed title to his name – chancellor of Trent University. Mr. Stohn’s appointment as Trent University’s twelfth chancellor was approved by University Senate on March 12, making him the second alumnus to hold the position in the institution’s 55-year history. Noted entertainment and copyright lawyer, Mr. Stohn was once described by the CBC as “the Forrest Gump of Canadian pop culture” as an instrumental figure in the Canadian entertainment industry throughout his career. A 14-time Canadian Screen Award (formerly the Gemini Award) winner, Mr. Stohn is well known as the executive producer of various iterations of the Degrassi television franchise and for his role as executive producer of The Juno Awards for close to 20 years. As an attorney, he has represented some of the most talented and successful artists Canada has produced in the last 30-plus years, helping to guide their careers to international success. Graduating from Trent in 1969 with a B.A. in Philosophy and Economics, Mr. Stohn has long been a supporter of the University. As a student, he co-founded Trent’s student newspaper, Arthur, as well as Trent Radio – both of which are still widely known to Trent students and the Peterborough community. Mr. Stohn’s transformational philanthropic support for Trent has been key in the development of several projects, including a $1 million gift to make the new Student Centre a reality. In 2015, he served as alumni-in-residence, participating and mentoring Trent students in workshops and seminars. The same year, he was awarded an honorary degree from Trent, the University’s highest honour. Since graduating from Trent, Mr. Stohn has enjoyed an outstanding career in the entertainment industry. He began his more than 50-year career in the industry as a performing artist and songwriter, before becoming a producer and a founding partner of a prestigious entertainment law firm. Currently the president of Skystone Media Inc. and its related companies, Mr. Stohn has been the executive producer of numerous television series including, Degrassi, Instant Star, Open Heart and The L.A. Complex. In addition, Mr. Stohn served for nearly 20 years as executive producer and then chair of the Canadian Academy of Recording Arts and Sciences who organize the Juno Awards, Canada’s music awards show. An entertainment and copyright lawyer since 1979, Mr. Stohn has been an active lobbyist for the reform of Canada’s copyright laws. He has been instrumental in the creation of the Songwriters Association of Canada and was director and chair of the Strategic Planning Committee of Ontario Media Development Corporation. As founding partner in the entertainment law firm, Stohn Hay Cafazzo Dembroski Richmond LLP, Mr. Stohn provides strategic legal advice to performers, advertisers, agencies, merchandisers, recording artists, songwriters, multimedia/internet creators, broadcasters and film and television producers. In 2011, Mr. Stohn was inducted into the Canadian Music & Broadcast Industry Hall of Fame, nominated for a Primetime Emmy Award, and won a Peabody Award. Mr. Stohn will be installed as Trent University’s twelfth chancellor at Convocation ceremonies to be held Friday, June 7, 2019 at 2 p.m.
Download high-res images of Stephen Stohn. Dr. Don Tapscott, C.M., B.A., B.Sc., M.Ed., L.L.D. Don is a member of the Order of Canada and is ranked the 2nd most influential management thinker in the world by Thinkers50. It is hard to imagine anyone who has been more prolific, profound, and influential in elucidating today’s technological revolutions and their impact on the world. 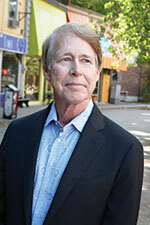 Don is a contributor to »The Huffington Post, »The Globe And Mail, »TIME, »The Wall Street Journal, and »Toronto Star. The role of the Chancellor includes conferring degrees and diplomas and sitting as an ex officio member of the Board of Governors and the Senate. 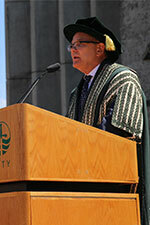 In addition, the Chancellor represents the University in an official capacity at external functions from time to time. Each Chancellor brings his or her special talents and interests to the position, and enters into and enhances the life of the University. The term of the office is normally for three years but is renewable upon the recommendation of Senate Executive and the agreement of Senate and the incumbent. January 23, 2016: The blockchain: big opportunity or big danger?